I must have been the last one to find out. Still there might be someone around who is more out of touch than I am and might be interested in this. 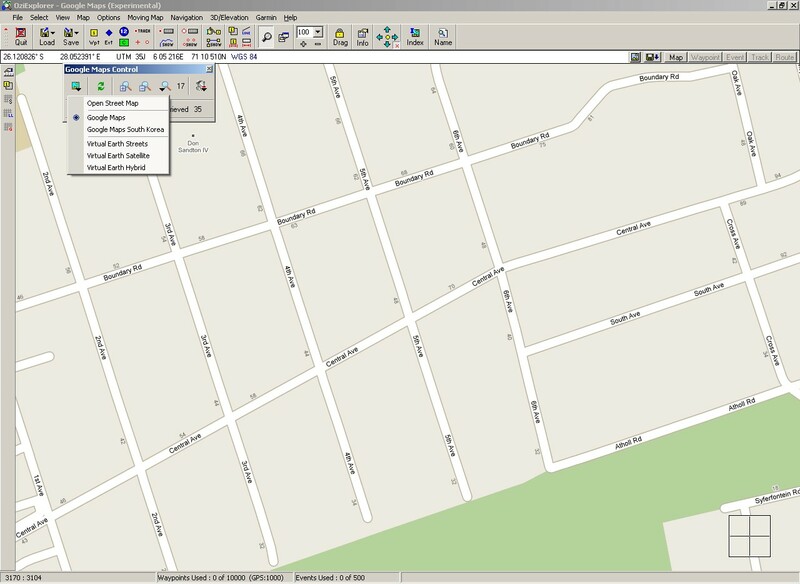 OziExplorer now supports (experimentally) a number of internet maps including Google Maps (streets only), OSM - Open Street Map and Virtual Earth (streets, satellite and hybrid). 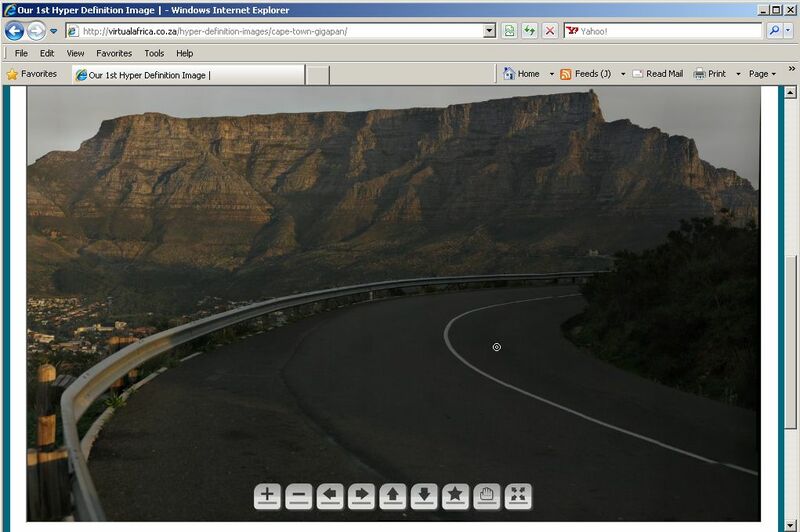 In addition there is a plug in which allows having Google Earth images as a background. And so I dropped whatever I was busy doing and decided to give it a try: first I had to download the latest version of OziExplorer (version 3.95.5g) and then the required additional installs for Google Maps and Google Earth . I followed the instructions step by step and I had no problem whatsoever. If you do then take a step back, repeat to yourself that after all you don’t know everything, get a pencil and start all over again, this time ticking each step in the instructions after complying. This is very unexpected! 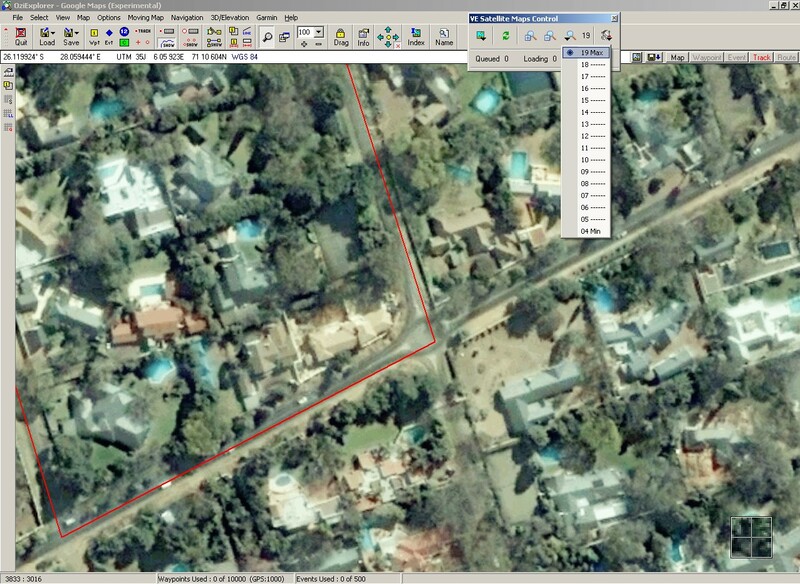 Imagery is more up to date than Goggle’s, at least in my Johannesburg suburb. May 2008 I think, Google maps is at least 6-7 months older than this. Level 19, 30cm/px … that’s actually an overzoomed 60cm/px image, same resolution as Google. Who needs Google? Well, in any case there is the Google Earth plugin still to test. It requires the Google Earth to be installed and set up for DirectX rather than OpenGL. Easy change in the GE option menu. Nicer colours, but then that’s probably end October 2007 after lots of rain and VE image was in the middle of the dry South Africa winter. 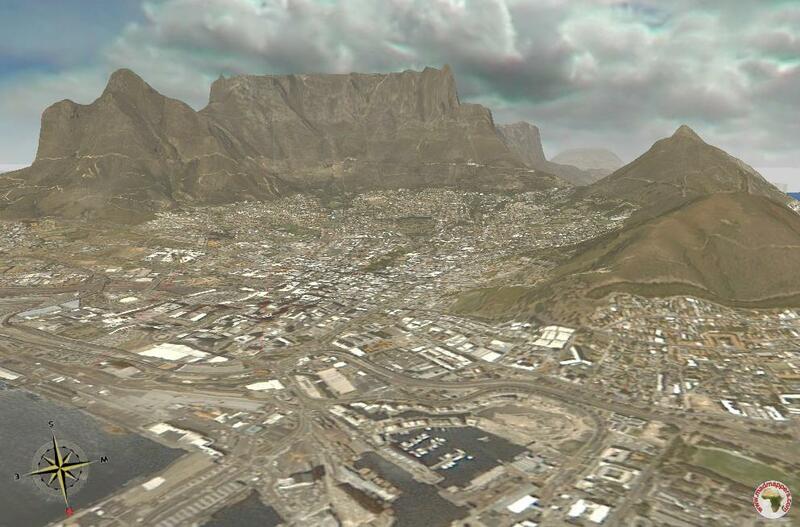 Still somehow Google Earth has always had the ability of rendering images prettier than the source image. The temptation is too much: let’s go 3D ! Big mistake. After all this GE plugin is a hack which “steals” via DirectX the image from GE which runs side by side. There are do-s and don’t-s and switching between OE and GE in Windows task-bar is definitely a DO NOT. After crashing OE I am more careful: I can sense that the OE-GE-DirectX combination is highly unstable. Tracks flicker, tilt resets on it’s own in some location nearby …. … with uglier (Spot 5) French imagery. Still who needs 3D when there are 360 hyper definition images around? Lots of good old fashioned stitching can do wonder! Sorry guys, for the moment South African raster maps are not available for download. Maps are kindly hosted on a server of a sponsor which has been experiencing dns problems. 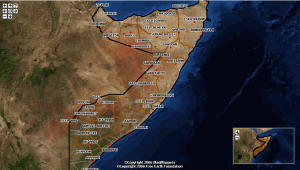 When SoMAP: webmap for Somalia crisis was released a WorldWind add-on was anticipated to follow. The release of Chad’s Mogadishu Refugee Migration World Wind Add-On required background maps and image data … it had to be done! 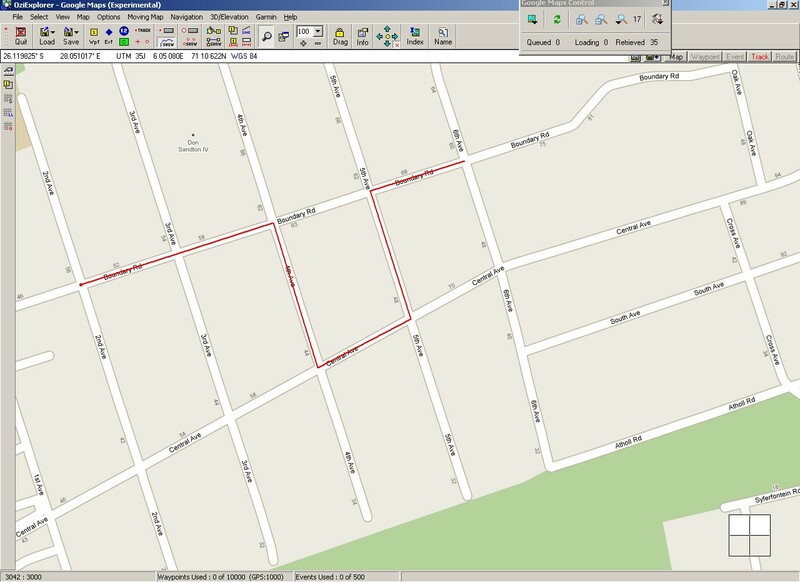 Somalia SWALIM add-on essentially comprises of the same data as SoMAP for 3D viewing in WorldWind: a set of topographical maps covering Somalia in 100k and 200k resolution, Vector data of Mogadishu streets and general data, and displays areas affected by flooding. 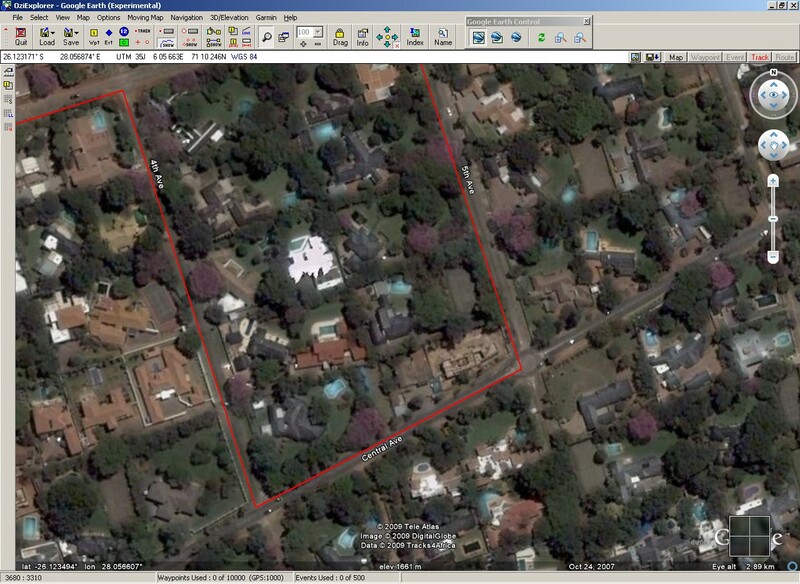 In addition selected areas also have 60cm/px Quickbird imagery provided by DigitalGlobe. Since SWALIM is the Somalia Water and Land Information Management project run by F.A.O. for Somalia, the focus of this add-on is flooding. Somalia is one of those unfortunate spots of our planets where Nature plays a testing game on its inhabitants: either too little water or too much. Years of drought are followed by years of flooding … with a vengeance. It is in this circumstances that historical data and careful land management becomes key not only to minimize impact of floodings but also to coordinate relief efforts in time of disaster. In the past weeks many have asked the same questions: what for? Nature is simply putting things right, these populations have asked for punishment with their conflictual behaviour … see … they are warring again! Astonishing: haven’t we learned anything from the past? And how unkind these comments are to the hundreds of relief workers who risk heir life daily! It is in time of extreme despair that religious fanaticism strives and undermines our societies, when Divine Intervention becomes the only hope for a better future. The lesser the desperation, the lesser the fanaticism, the less the conflicts. A relief truck which can find its way to destination does make a difference. Close your eyes for an instant and just imagine a desperate father, in a refugee camp somewhere in Africa, powerless next to his dying son, desperation building up moment by moment and so the anger towards everything and everyone … and then suddenly the view of a white UN truck driving into the camp … hope! … I can see his smile, hope rushing back … and then, years later at a bonefire, imagine him again telling everyone of that glorious day when No-one was there and then miracolously a white truck arrived as an angel. And, as I have just learned, we, the WorldWind community, do indeed make a difference. Somalia - Chad at Earth is Square normally focuses his attention on WorldWind content (since he is a developer of the NASA-sponsored virtual globe). But, he was recently asked to develop a map showing human displacement issues in Somalia for both WorldWind and Google Earth. This is similar in concept to the Crisis in Darfur layer to help make people aware of human atrocities. 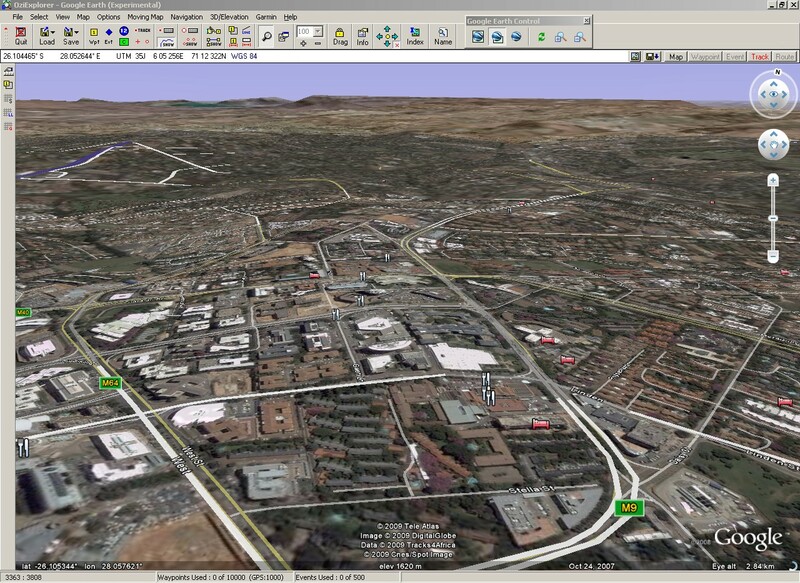 Chad started by creating an add-on for WW, and then develops a similar one for Google Earth . Since WW supports KML, it seems to me he should have just developed a KML file and the same file could be supported by both applications. Regardless, great work Chad! … Google suddenly populates Google Earth with Somali data. It has been a busy day. 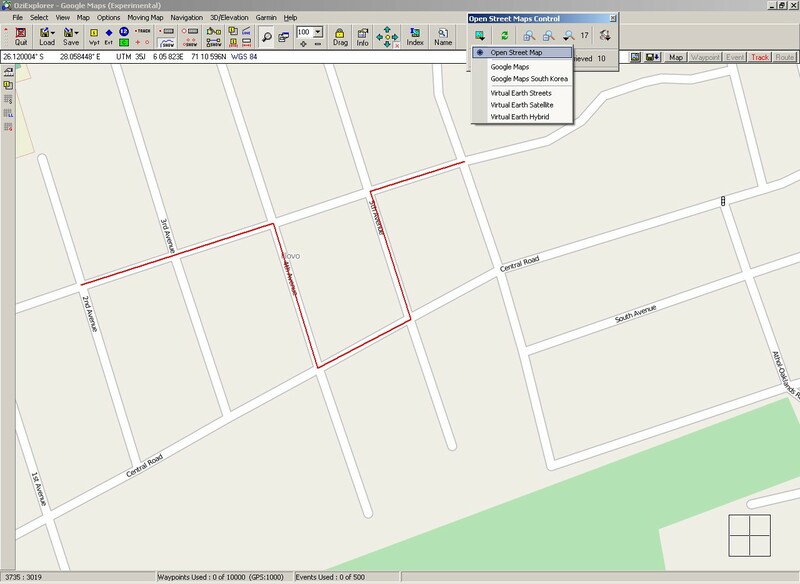 For details of the SWALIM add-on put together by Bull_UK please refer to his blog. In occasion of the 2005 World Space Week WorldWind South Africa was introduced in South African schools. 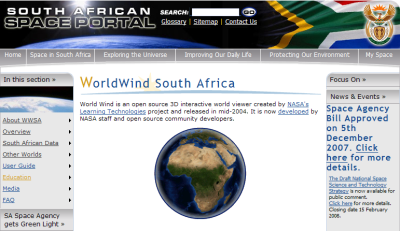 This electronic atlas of Southern Africa fruit of the collaboration of MadMappers, NASA, the SA Department of Science and Technology and coordinated by the SA Space Organization has now its own WorldWind South Africa portal. The portal was realized by MadMappers in association with WorldWindCentral under the expert supervision of Bull_UK of the Free Earth Fundation. South African space science and technology contribution to sustainable development is coordinated by the National Working Group on Space Science and Technology. Space Technology being defined as the technology in satellites and ground systems used by space scientists both looking up to study the universe and looking down to earth. It also includes delivery of services to users on the ground. South Africa has a long tradition in space dating as far back as to 1685 and in Africa has a leading role in terms of facilities. A South Africa Space Agency is currently being established and the ZA002 Small Satellite Programme is under way. The first satellite, named SumbandilaSat, will be positioned in a Low Earth Orbit (LEO) to enable it to take high resolution images which will be used for agricultural and environmental management applications. 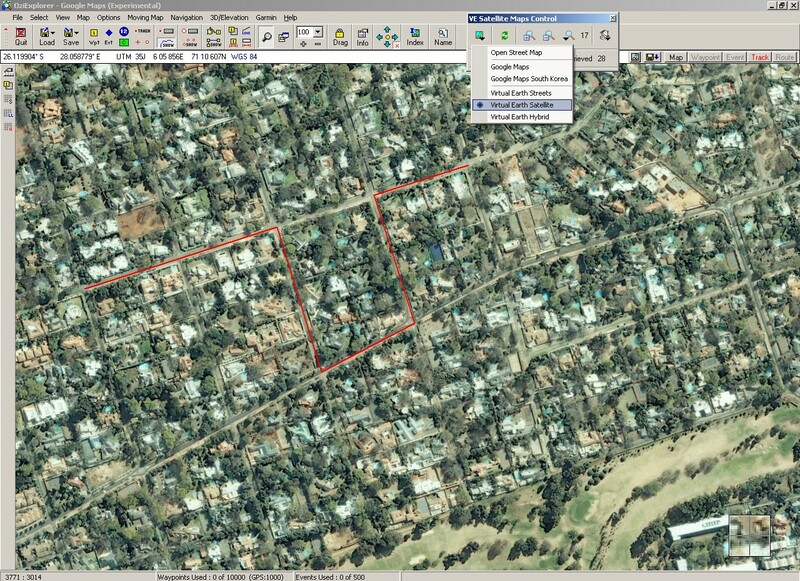 MadMappers’ aim is to offer African users an open source customable platform on which to display spatial information relative to their country. 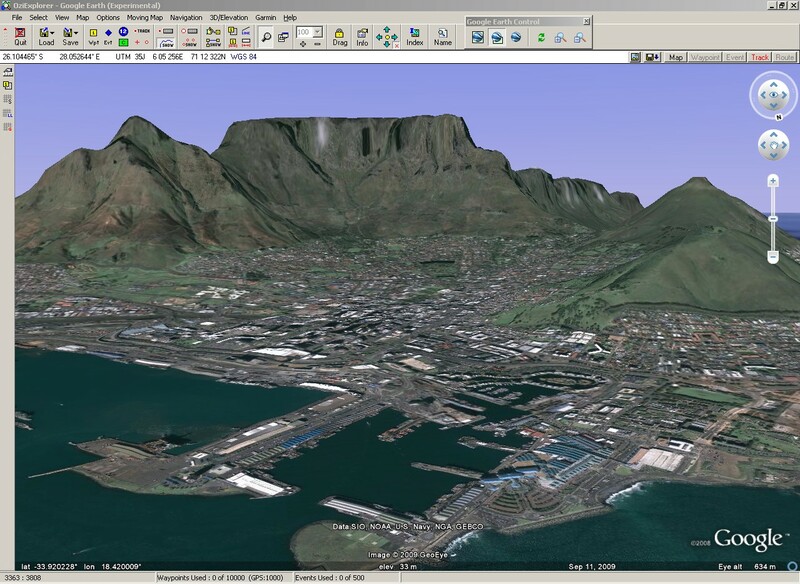 World Wind Africa servers already supply a wide selection of data, ranging from topological maps to vector data, from aerial photography and very high resolution imagery to DEMs. Hopefully in a not too distant future we will be able to make South African satellite data from SumbandilaSat accessible to all. Special thanks to the Free Earth Fundation and the World Wind Community (in particular to Nowak, f0urtyfive and Bull_[UK]) for making this project possible.